The Battle of Waterloo has taken place once again. Had these teams not been so close by, this game probably would not be made out to be much due to Laurier consistently beating Waterloo for the past 15 years. In a nail-biting 34-32 win on Laurier’s home field, Waterloo finally broke the streak against the Hawks. While this may have been a surprise to many considering Waterloo’s reputation for being the basement dwellers of the OUA, Coach Faulds was not surprised as to how good of a team the Warriors are. “I don’t think anything surprised us. We knew they were improving each and every week defensively and we knew offensively, their quarterback is super talented and they’ve got a good receiving core. We knew it was gonna be a hard fought game. Despite the score from previous years, no one internally thought it was gonna be that,” said Coach Faulds. In a game that started out as what would seem to be a shootout, ended up taking everyone for a ride. After an exciting back and forth first half that ended with Laurier leading 22-17, the shootout would cool down. 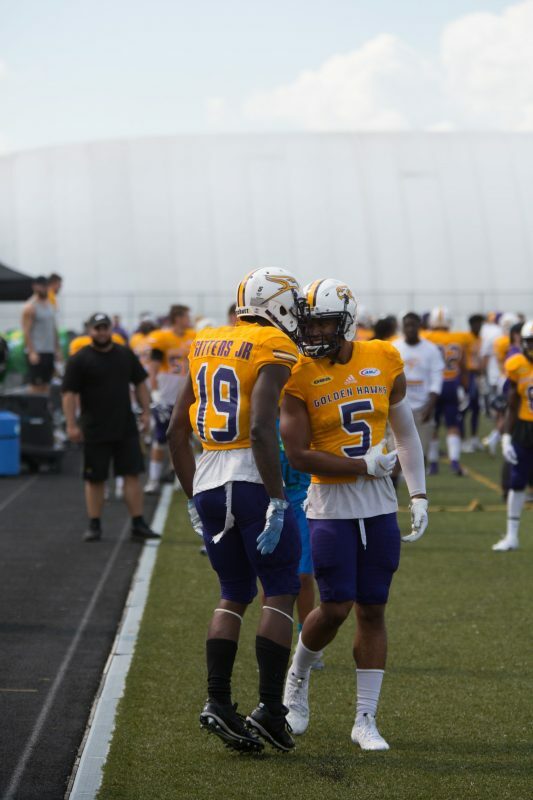 Defence took over, especially for Laurier, as they held Waterloo scoreless in the third and it looked as if Laurier found the recipe to victory. This was until the dynamic duo of Tre Ford and Tyler Ternowski took over. The Warriors scored with seven minutes left to make it 32-27. The on the first play of their drive at the 3:08 mark, the duo struck again as Ford found Ternowski for an 88-yard touchdown on an intermediate route to make it 34-32. With 2:32 left, Laurier failed to capitalize on not one but two drives to get a field goal to win the game as they took their first loss of the year. Next up will be the McMaster Marauders in Hamilton next week for the Golden Hawks as they look to bounce back.